If you didn't go to the store and buy a paper lottery ticket for yourself, then you didn't win. No one chooses e-mail addresses or mobile phone numbers as "lottery winners." Greetings to you and your family. We are happy to inform you that you were selected for a cash prize of (500,000 Great British Pounds) and Black Berry Mobile phone from the on going BLACK BERRY online promotion that was held on the 20thth of March/2011 through online ballot and your email address attached to ticket number BB/OMG/STFU/837. 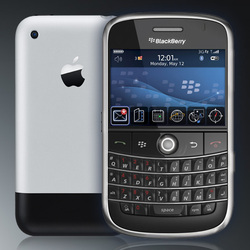 The aim of this promo is to enhance and encourage the use of Black Berry mobile phone all over the world. Your email address was among the 100 lucky winners out of over one million email address that were randomly selected from our random search engine selection. Congratulations from the Blackberry corporation worldwide. Your winning prize is ready for remittance to you, therefore, we request that you send the below listed information to enable us process and remit your winning sum and your brand new black berry phone to you in due time. Please forward these information to us for processing of your prize claim not later than one week from draw date or regard claims null, void and invalid. Once again, congratulations and note, your winning is hereby announced to be confidential to avoid abuse and mis-use of our program and to avoid double claiming and fraud. This is not from Black Berry Inc.
Let's add a few more ! 's to see if I "won" yet. Your email address has not won 250,000.00 British Pounds in this Year Nokia United Kingdom Mobile Promo. To claim E-mail your Name, Telephone number and address to nfagency@gmail.com. This is a free e-mail address that has nothing to do with Nokia whatsoever. Notice that "Wayne's" e-mail address here is nokiapromtin@noika.com (not Nokia), but he wants you to respond to nokiapromtin12011 @yahoo.co.jp, which is a free e-mail address. Noika.com today leads to nokiame.com, which is some sort of search portal. Nothing here has anything to do with Nokia at all. Neither Nokia nor any other corporation has any "lottery," and no one chooses "winners" by e-mail address or mobile phone number. There is no such thing as a "corporate lottery." Your prize award has been insured with your email address and will be transferred to you upon meeting the requirement of the gaming board authority which is your statutory obligations. Be advice that all information pertaining to this WINNING FUNDS should be kept extremely CONFIDENTIAL till the funds get to you. This is to avoid DOUBLE claiming of prize. Congratulations from all members and staff of the promotion. We look forward to stealing from you.